General information about schools admissions can be found on GOV.UK. All school admissions in England are governed by the Schools Admissions Code. See page 25, paragraph 2.18 of the School Admissions Code (December 2014). Under the above code, all admissions authorities in England must accept an application and allocate a place for children of armed forces personnel on proof of assignment and in advance of moving to the area. Parents do not need to have an allocated address and applications can be processed on the basis of the unit address or general quartering address. (Although places may not be allocated a long time in advance of the move, as this may result in a school having to hold a place open for an unreasonable amount of time.) The covenant will not automatically help parents to get the school of their choice. Local authorities must find a school place for all children who move into their area. However, if no places are available at the parents’ preferred school, there is no duty to comply with parental preference. Applications for admissions into Reception year and year 7 are governed by a national statutory timetable. Parents who are posted after the statutory deadlines may have to make ‘late applications’. Admission authorities cannot refuse applications because they are late and cannot give priority based on the date upon which applications were received. However, in practice many school places will already been allocated, offered and accepted by other families. Local authorities are not permitted to reserve blocks of school places for service pupils even where there are likely to be significant numbers. If there are no places available at their chosen school, pupils may be put onto waiting lists for places as well as being offered a place at another school. Waiting lists are determined by the over-subscription criteria for each school. By law looked after children must be the first priority for all over-subscription criteria as these are deemed to be the children most in need. Under section 1.39A of the Schools Admissions Code children eligible for the service premium may be given priority in over-subscription criteria. In practice many over-subscription criteria do not mention service pupils or these may come low down the list behind criteria such as distance from school or siblings in the school. By law classes for children in Key Stage 1 cannot exceed 30 pupils per teacher. Under the Schools Admissions Code in England children of service personnel who move outside of the normal round of admissions may be admitted as excepted pupils. It is important to note that this only applies to ‘in year’ admissions and will not assist service parents who are applying for a Reception or Year 7 place under the normal admissions process. It is also important to know that many local authorities are reluctant to exercise this power as standard practice. In these circumstances we would always advise parents to seek specialist advice from CEAS or other similar organisations as appeals against infant class size limits are notoriously difficult to win. The Scottish Government has produced some really useful resources for service personnel and their families moving to Scotland. Further information about schools and admissions can be found from CEAS. 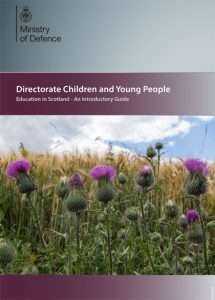 The Directorate Children and Young People Education inScotland has produced an Introductory Guide. Admissions to schools in Wales are governed by the Welsh Schools Admissions and Appeals Code. Further information is available on the Welsh government website, Supporting Service Children in Wales or from CEAS. The Children’s Education Advisory Service (CEAS) provides expert and impartial advice about the education of service children.